Yesterday, Clif and I had many errands to do in Augusta, the city nearest the little house in the big woods. To keep up our strength, we decided to fortify ourselves with donuts at Doc Hollandaise. Last week, Clif went there with his co-workers, and when he came home from work, he raved about the donuts. As a donut lover—make that fanatic—I knew a trip to Doc Hollandaise would soon be in my future. Doc Hollandaise is a breakfast place, and most days they are only open until noon. Along with the donuts, cooked fresh to order, they serve the usual delicious suspects—omelets, bacon, homefries, toast, and other breakfasty things. But we were there for the donuts, and donuts were what we ordered. I chose a chocolate coconut donut. 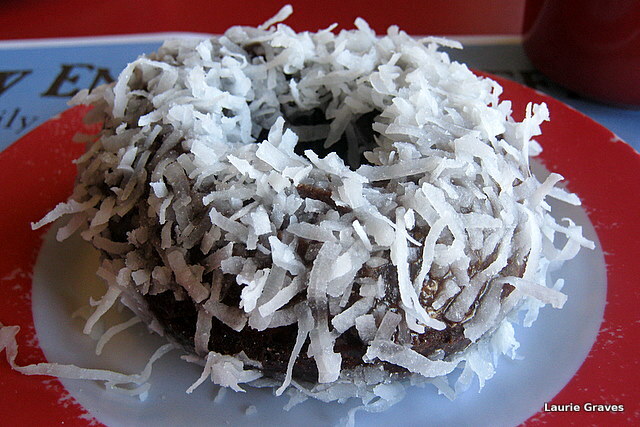 Rich and tender with flakes of coconut on top, it was delivered warm, and the donut was so tender I had to eat it with a fork. Clif decided to go whole hog, so to speak, and ordered a maple bacon donut. It seemed to me that this was perhaps a step too far down the donut-topping path, but Clif liked it so much that he didn’t even offer me a bite. That donut was gone in a flash. 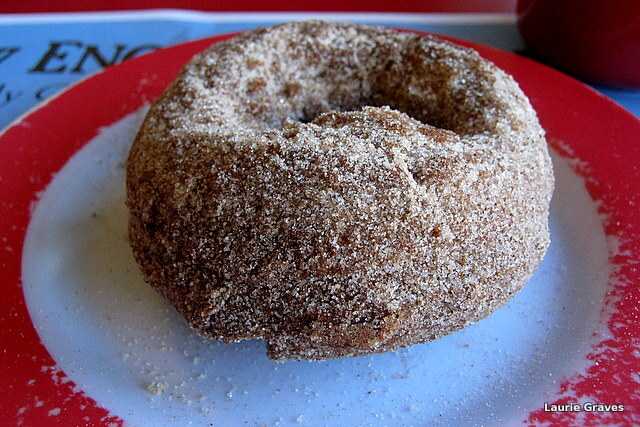 In the interest of reporting for this blog, we ordered a third donut—cinnamon sugar—which Clif did share with me. It was crisp and warm and had a lovely old-fashioned nutmeg and cinnamon taste. We spoke a bit with our server. She told us about the owner, Ann Maglaras, who uses buttermilk and kneads the dough with flour before cutting the donuts to order. Each batch only makes about twenty-three donuts, which means Maglaras frequently has to make more dough to satisfy the customers, who come in droves for those warm and wonderful donuts. Duly fortified, we spent the rest of the morning doing our errands. Afterwards, we took a back road home, where I was able to see Maine October in all its glory—an old man sitting by a pile of burning leaves; the marsh grass burnished to copper; leaves coming down from trees in a flutter of gold. 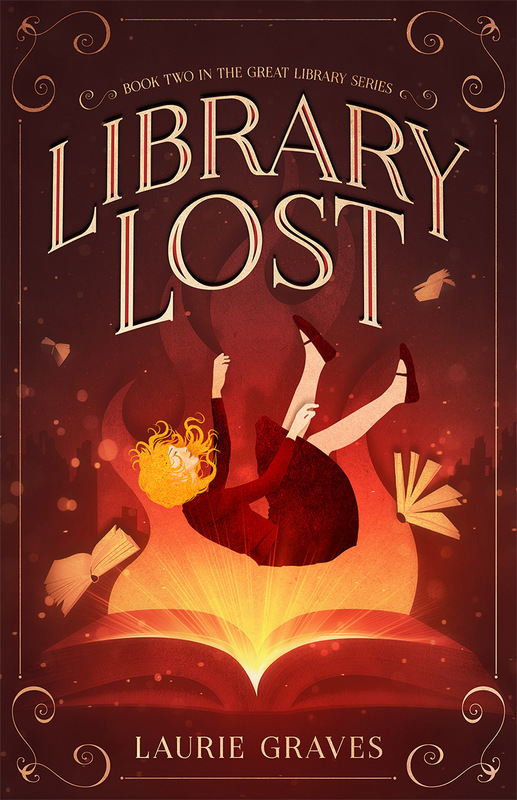 This was all illuminated by that clear October light, golden and at a slant. After I got home, I swept the patio and wiped the outdoor tables. The day was so mild that I said to Clif, “Let’s have our supper by the fire pit.” Now that he is retired, we don’t have to save those activities for the weekend. And this we did, eating our egg rolls, rice, and chicken by the fire. The dog lay beside us, getting a treat now and then. (All right, getting a treat very often.) We listened to music—Talking Heads, Counting Crows, and We Might be Giants. The crickets’ fall song provided the backup. We know, of course, that donuts can only be an occasional treat, and most of the time we will eat pears, apples, and grapes for our snacks. Ditto for the Chinese food, and tonight I’ll be making a fish casserole for supper. But treats add spice to life, and in moderation, they are good for the soul, if not the body. You have done it again………taken simple things, the essence of life and have written to share those things. Thank you. Shannon, you would have to be in Augusta by midmorning. The place closes at noon most days. Sounds like my kind of breakfast place! Maple bacon donut? sign me up My hometown festival is this weekend and my first stop is the boy scouts pumpkin donuts fresh out of the fryer. I usually buy half a dozen to bring home – they are so good! Eliza, enjoy those pumpkin donuts! As for the slant of autumn light…great minds think alike? Ah, my taste buds are blooming . . .
Christine, you are most welcome! 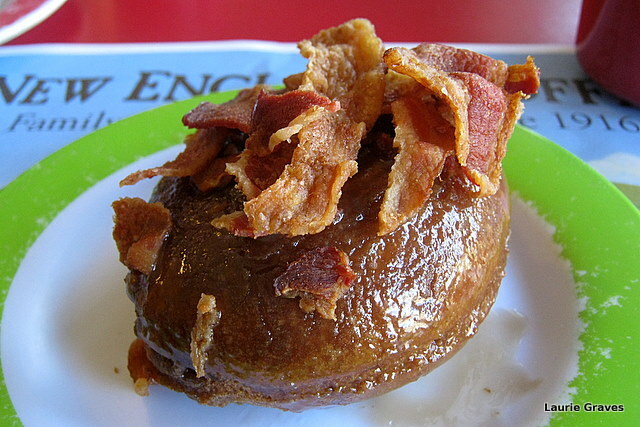 It all sounds great … except for the maple-bacon donut. Jason, the maple-bacon donut didn’t appeal to me, either, but Clif really liked it. This brought back memories. I can see my mother in the kitchen making donuts. She would make the donuts with no hole in the middle but she’d put jam inside. Good post. Thank you for digging up a memory. You are most welcome, Joanna. I love donuts with jam in the middle. Your mother’s donuts sound great!